MK Smotrich scheduled to meet with UTJ members to create haredi-religious bloc in religion and state ahead of coalition negotiations. 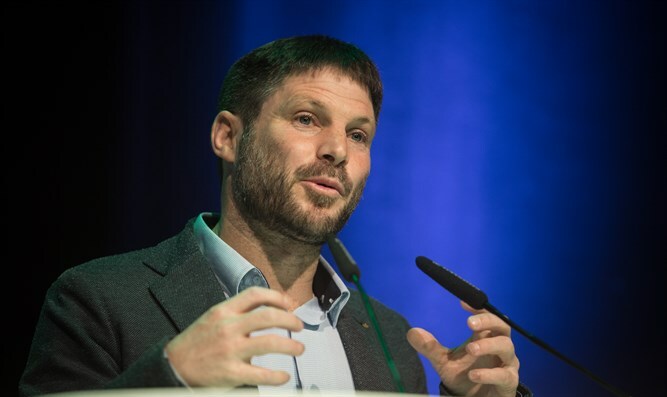 National Union Chairman and number two in the Right Parties Union Bezalel Smotrich is scheduled to meet on Tuesday with United Torah Judaism members in Bnei Brak. The goal is to create a religious-haredi bloc in matters of religion and state ahead of coalition negotiations with Likud representatives, and in view of the difficulties that Avigdor Liberman is expected to cause around the Draft Law, according to a Channel 13 News report. It is unclear whether Shas will take part in the meeting. Earlier on Monday evening, Smotrich spoke about the US President's peace plan, declaring "we won't sit in a government that accepts the plan. "If, Heaven forbid, there's a plan to hand over an inch of the land of Israel to the Arabs, we won't be part of such a thing," Smotrich said. Regarding the coalition negotiations, the National Union Chairman said "we're demanding the Justice and Education portfolios, and we'll demand a significant grasp on religious services. It isn't something that can remain only in the hands of Shas."